NFL: Throwing A Flag On The NFL | NFL News, as it happens, when it happens. Your one stop shop. Last year was bad, but this year has seemed worse. No, I’m not talking about the quality of play in the NFL…I’m talking about seeing a flag dropped on what feels like every play. It turned ridiculous as the 2013 season got underway and it just continues to get more and more annoying each year. Keep in mind, those are penalties that are accepted. Add in those that are declined and you get the picture. Too many penalties! From the desk of always reliable Mike Reiss According to the Elias Sports Bureau, there were 298 accepted penalties in Week 2 and 504 accepted penalties through Week 2, both of which are the most in a single week (minimum 6 games) and through the first two weeks of a season in NFL history. After years of denial regarding their responsibility in concussions, the NFL finally realized they were going to continue to lose huge sums of money in player lawsuits. They looked foolish (the NFL looking foolish – no way) by continuing to deny the connection between the violent contact in the sport and head trauma despite the continued piling up of evidence to the contrary. The comparison to tobacco companies claiming there was no link to smoking and cancer comes to mind. Suddenly the term “had his bell rung” stopped being funny. Getting dinged was now a serious concern. An Associated Press article posted 1/29/2015 indicated the tougher stance on penalties was working, according to NFL Statistics. The article stated there were 111 concussions in games during the 2014 regular season, down from 148 in 2013, and 173 in 2012, a 36 percent drop over that three-year span. If those figures are correct no one can complain about the increase in penalties for hits to the head. That said, the penalties that are being called many times now have no impact on concussions. No one wants to see a player get injured, but let’s face it, everyone playing this game gets hurt sooner or later. The question is, how badly? Throwing 20+ flags in a game doesn’t lower that fact. This is one you see in almost every game at least once (admit it, seems like it is called every time doesn’t it?). Replays often show the contact was borderline at best, but the flags fly. How many times have you watched the replay and it just wasn’t there…or the push in the back was actually on the side as a player turned as he was being hit. Things happen so quickly as players are running full tilt on a collision course while the ball is in the air, making it almost impossible for the officials to see the exact angle of contact. Please, no more time-consuming reviews, but the number of penalties could be cut if officials were told by the league to only throw the flag when the foul is obvious and has an impact on the play. Don’t you just love that little huddle where the officials gather in a circle for what seems like an eternity (actually just a few seconds) while they discuss who did what to whom and where did it occur. Anyone remember them picking up that flag and saying “Oops, no foul” on that play lately? C’mon man, this one is called numerous times in every game. The ultimate “judgement” call that usually goes in favor of the receiver. The tick-tick barely touch flags need to stop…now! 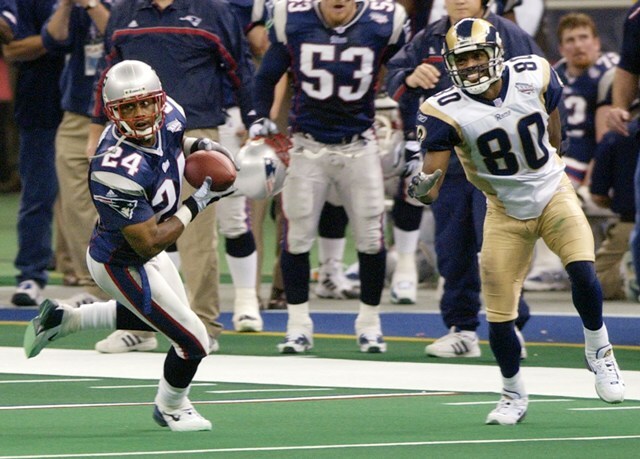 In the New England Patriots 2000-2001 play-off run to their 1st Super Bowl teams along the way (hello, St. Louis) cried the Patriots secondary was playing “too rough” and it was ruining the game. Well, as we all should know by now, the league jumped and things were tightened up, eliminating all “contact” in the passing game. It’s time for the pendulum to swing back to the middle after all these years. We’ve all heard that this is something that could be called on every play, and I don’t know about you, but I believe it. Since that is the case, how do officials decide when to throw a flag or let it go. I sure don’t want to see more flags, but right now its way too subjective. Is there a solution to this one?